According to the most recent Doing Business Rankings published annually by the World Bank, Ireland is the 18th most business-friendly country in the world. When we are talking only starting a business, things look even better for Ireland as it finds itself in the tenth place. And while starting a business in Ireland is easier and more straightforward than in the majority of other countries, it is still a complex process, especially when you don’t have the initial capital. The good news is that the Irish government and several other organizations, provide a number of funding options for Irish entrepreneurs. For Irish citizens who are thinking of starting a business or who own a young company, the first stop on their entrepreneurial journey is usually one of the Local Enterprise Offices. The LEO program provides invaluable information and support for anyone who wishes to start and grow a business in Ireland. There are 31 teams spread across Ireland as part of the Local Authority network and they work to give a helping hand to the smallest businesses in the country. Besides providing fantastic insight and support for business owners, Local Enterprise Offices also provide financial support for eligible businesses. Feasibility study grants – up to 50% of the investment or €15,000 (whichever the lesser) to be used for market research, consultancy costs, prototype development and other earliest expenses. Priming Grants – up to 50% of the investment or €150,000 (whichever the lesser) to be used for capital items, salary costs, overhead costs, marketing/innovation/consultancy costs within the first 18 months of starting a business. Business expansion grants – up to 50% of the investment or €150,000 (whichever the lesser) to be used for growing a business after the initial 18 month start-up period has expired. The money can be spent in the same ways as with the priming grants. Of course, it goes without saying that there are strict requirements for getting these grants, most of which revolve around exhibiting a solid business model, a potential for improving the overall economy of the area and the potential for creating jobs. Find out more at https://www.localenterprise.ie. Enterprise Ireland is a government organization whose aim is to support the inception and the growth of Irish enterprises that will participate in the world markets and which are aimed at exporting their services and products. This program is eligible to start-ups that are considered to be High Potential Start-Ups, which means that they have the potential to develop a service or a product that can be sold on international markets, and which can generate 10 jobs and €1m in sales within three to four years of their inception. HPSU funding program provides grants and support for start-ups in the three main stages of start-up lifecycle – feasibility stage, investor ready stage, and growth stage. All of these three stages are covered with different types of grants and other support. You can find more about these here – https://www.enterprise-ireland.com/en/funding-supports/Company/HPSU-Funding/. Enterprise Ireland also has a program for established SMEs which they define as companies that have an established trading record, which employ anywhere between 10 and 250 employees and which have an annual turnover of under €50m or an annual balance sheet of under €43m. New Frontiers is another entrepreneur development programmed which is funded by Enterprise Ireland and delivered by Institutes of Technology at a local level. This programme is aimed more at startup companies which are looking to innovate and come up with something completely new. Testing your business idea – Over the course of this phase, participants attend workshops during which they will do market research and business validation through which it will be decided whether their business model is viable and how risky starting a business based on it will be. Business Planning – Participants whose ideas have been proven to have potential will enter a 6-month incubation period that will be supported by a strong network of advisors and facilities, as well as by a grant of up to €15,000. Participants will also get access to Amazon’s and Microsoft’s tools and support which is worth much more. Business development – Participants whose businesses “survived” phase 2 will be directed to private and government investment opportunities, also providing further support and facilities. Regional Enterprise Development Fund is the most recently established fund developed by Enterprise Ireland. The funding will be delivered through two Scheme calls (first call will provide up to €35m in grant support and the second one what is left of the initial €60m budget) which will award funds to collaborative and innovative initiatives that will hold potential for significant regional or even national impact. Among other things, they will have to show the potential to create and sustain new jobs. Depending on the scope of the project (local to national), the grants will range from €50k to €5m and they will only be available to Designated Activity Companies (DAC) or Companies Limited by Guarantee (CLG). It should be pointed out that these Scheme calls are time-sensitive with the closing date for the first call is 18th August 2017 and the second call will be open between 8th January 2018 and 2nd March 2018. Enterprise Ireland has also developed an initiative to help connect Irish small businesses and Ireland’s public knowledge providers (public research organizations, universities, etc.). As part of this initiative, small businesses that work together with such an organization on a business opportunity of some kind are entitled to Innovation Vouchers which are worth €5,000. The calls for these vouchers are usually time-sensitive and the calls are announced regularly. Over the next few years, we will witness one of the biggest events in the history of European Union with the United Kingdom leaving the Union and with innumerable processes taking place which can and will affect Irish businesses as well. Enterprise Ireland has therefore established a grant for Irish small businesses that predict major disruptions to their business as Brexit nears and starts to take place eventually. The funds provided by this grant (up to €5,000) are to be used to find new markets and strategies that will allow such SMEs to survive Brexit without suffering too much harm. Enterprise Ireland also held a competition in 2017, aimed at start-ups whose owners are women and whose companies could be considered HPSUs, as mentioned earlier. The competition ended in May, but there may be similar competitions in the future and it is important to be aware of the possibility. Microfinance Ireland is a not-for-profit lender whose purpose is to deliver small business loans that come from the Government’s Microenterprise Loan Fund. They provide loans for small business with 10 employees or fewer and whose annual turnover is less than €2m. The primary purpose of Microfinance Ireland is to provide access to funding to businesses that have difficulties procuring loans from commercial lenders and banks. Microfinance Ireland provides unsecured loans of anywhere between €2,000 and €25,000. In order to be able to get such loans, the proposals need to be commercially viable. They collaborate with the Local Enterprise Offices and Local Development Companies and provide mentoring to ensure loaned funds are put to use in the best way possible. JobsPlus is a government employer incentive through which employers get rewards for employing jobseekers from the Live Register. For each person that was unemployed for between 12 and 24 months, the employer will receive a payment of €7,500. The payment is increased to €10,000 for a recruited person who has been on the Live Register for more than 24 months. It should be pointed out that job seekers under 25 qualify for this incentive after only 4 months on the Live Register under the JobsPlus Youth initiative. Back to Work Enterprise Allowance (BWAE) and Short-Term Enterprise Allowance (STEA) are two government schemes that are aimed at people who are on social welfare and who wish to become self-employed, i.e. start their own business. These two schemes are very similar and they provide both financial and advisory help to unemployed individuals who wish to start their own business. The financial help is provided as part of the Enterprise Support Grant which goes up to €2,500 in any 24-month period. Besides various grants and funding options, the government also offers various tax incentives for small business owners and those who wish to invest in such businesses. For example, under the Start Your Own Business Scheme, unemployed people who start their own business and quality for this scheme are exempt from paying income tax up to €40,000 per annum for two years. Startup Refunds for Entrepreneurs is another tax refund scheme where new entrepreneurs are entitled to an income tax refund of up to 41% on the capital invested in the company. In addition to this, depending on how much they invested, entrepreneurs may be entitled to a refund of the PAYE income tax that they paid over the period of six years prior to making the investment. Crowdfunding has become very common in the world of entrepreneurship and small businesses trying to secure funding. For Irish entrepreneurs, there are a few options to choose from. At the moment of writing this guide, there are 762 Irish projects getting different kinds of backing on Kickstarter. While some of them are still struggling to attract any kind of community backing, there are also projects that have met and exceeded their goals that are often in tens of thousands of Euros. As opposed to Kickstarter which is global, Fund It is Ireland-based and it feels more local and approachable for that matter. It is possible to crowdfund much more than just businesses and it can feel somewhat difficult to raise money for a “traditional” kind of business, but that is the downside of crowdfunding in general. SeedUps is a crowdfunding platform available to startups from the U.S., Canada, the UK, and Ireland. According to the website, it is possible to raise anywhere between $25,000 and $500,000, of course, if one’s business idea happens to catch the eyes of investors. Peer-to-peer lending is exactly what is sounds – ordinary people providing loans to other people (in our case entrepreneurs) and getting their money back with interest. There are two major P2P business loans platforms popular in Ireland – Linked Finance and Grid Finance. Linked Finance is the standard for Irish peer-to-peer business lending, enabling small businesses to borrow anywhere between €5,000 and €250,000 with interest rates fixed between 8.5% and 15%. Entrepreneurs put up their loan requests and it is actually lenders who bid. Entrepreneurs are then given a fortnight to accept loan offers, although everything usually happens much faster. Grid Finance works in a similar way, putting together lenders and borrowers. On Grid Finance, it is possible to get loans of up to €150,000, over a maximum of 36 months. The rates are once again fixed and repayments are made monthly. Incubators and accelerators are organizations which are aimed at facilitating the development and the growth of start-up businesses. Incubators are aimed at enabling the development of companies, providing support systems and sometimes seed capital, while accelerators are aimed at helping already existing start-ups grow. Ireland features some of world’s best incubators and accelerators. Angel investors denote wealthy individuals or organizations which invest in a start-up business and small businesses in general, providing mentorship and seed capital, usually in exchange for equity. There is a huge number of angel investors in Ireland, but the organization that sets itself apart is the Dublin Business Innovation Centre (Dublin BIC), part of the international EBN innovation community. Dublin BIC manages the €53 million –heavy AIB Seed Capital Fund. It also manages the Halo Business Angel Network which has invested more than €40 million in Irish enterprises and which supports a number of Irish angel investor networks. The Guinness Enterprise Centre is also associated with BIC. There are many over the age of 50 starting new businesses. One source of funding for this age group is the possibility of accessing their pension fund early. But, this was intended for a specific purpose so using early retirement could be a risky option leaving you with little later when it is really needed. 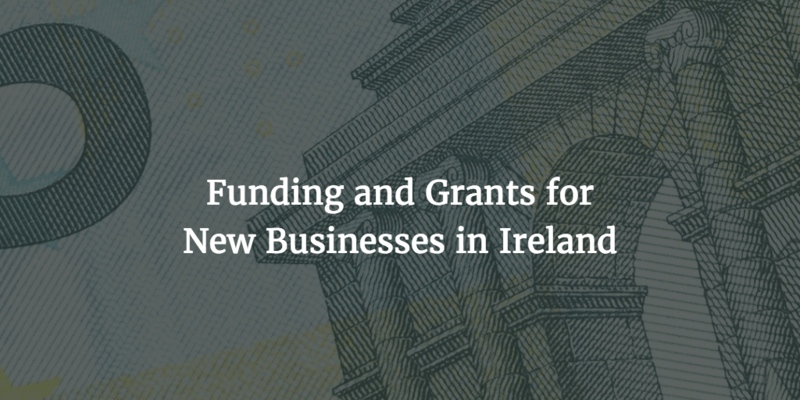 There is definitely no shortage of grants and funding options for new businesses in Ireland. The important thing is to keep your eyes open for any and all programs, grants, tax incentives and investment options. Your business may not be eligible for all of them, but is more than likely you will be able to find something that will benefit your new business. Ask your accountant if you have one if you don’t yet have one see the new startup offer at AccountantOnline.